"We and our fellow small business owners want to support this move in favor of worker fairness.... Over half of New York City's four million private sector employees depend on us for their jobs; please work with us to make sure we can stay around to provide them." --Rebecca Fitting and Jessica Stockton Bagnulo, owners, Greenlight Bookstore, Brooklyn, N.Y., in a public letter in response to New York City's proposed paid vacation legislation. 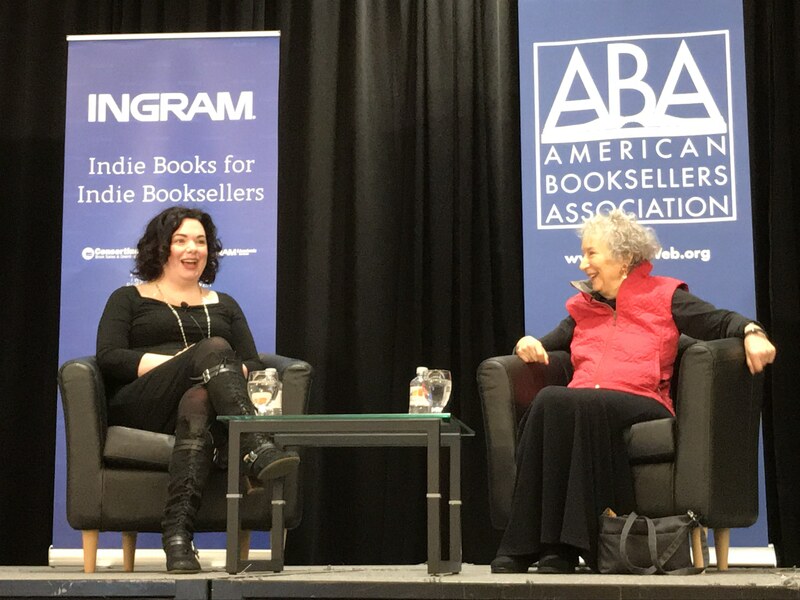 The second full day of Winter Institute 2019 began with a lovely "Super Bowl halftime show" by the Bookshop Band and the amusing, astute Margaret Atwood in conversation with Erin Morgenstern (see story below). The program ended with the packed authors reception. 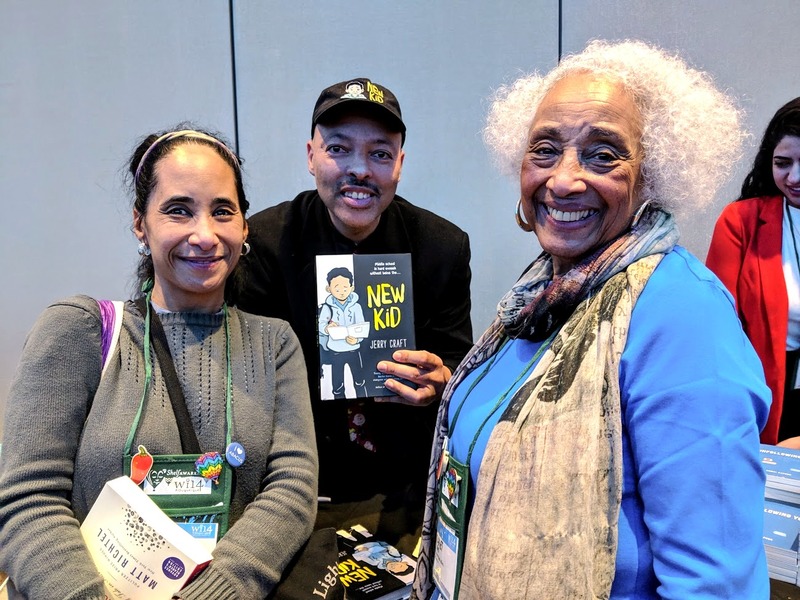 Highlights of the day included Hanif Abdurraqib's keynote that touched on the power of reading, books and bookstores (see story below), a lively town hall and many informative panels. Although the Winter Institute ends this evening, our coverage of this great event continues next week! 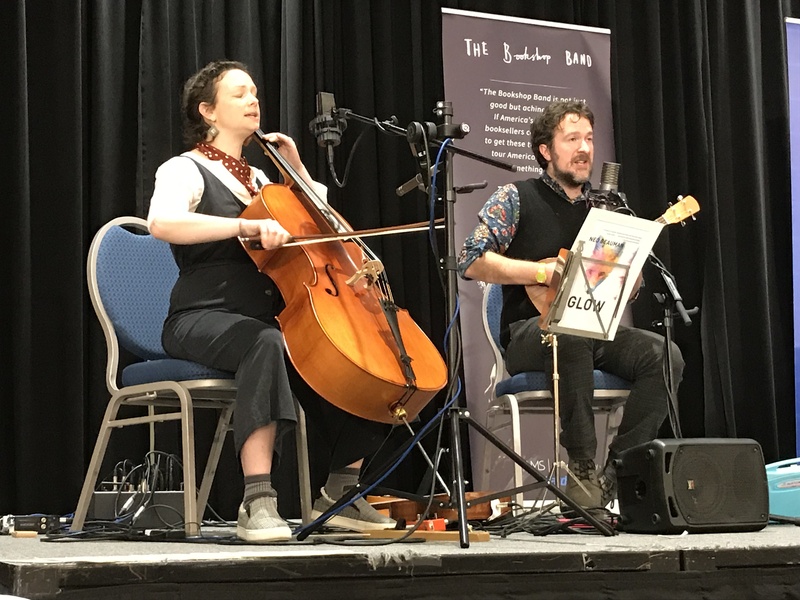 To great applause, the Bookshop Band played three songs at yesterday morning's breakfast; they were introduced by Nic Bottomley, co-owner of Mr B's Emporium of Reading Delights, Bath, England, and president of the Booksellers Association of the U.K. and Ireland. He noted that the idea for the band--composed of Ben Please and Beth Porter--came up when he told Please he wanted to do something different for shop events, possibly something musical. In response, Please formed the band and said they'd write and play songs based on books. The duo has played several times during Winter Institute, but yesterday's performance was what Bottomley called "their Super Bowl halftime show." It included a crowd sing-along with the line, "Smog over London; looks jolly splendid, I've heard," from a song inspired by The Strange Affair of Spring Heeled Jack by Mark Hodder. 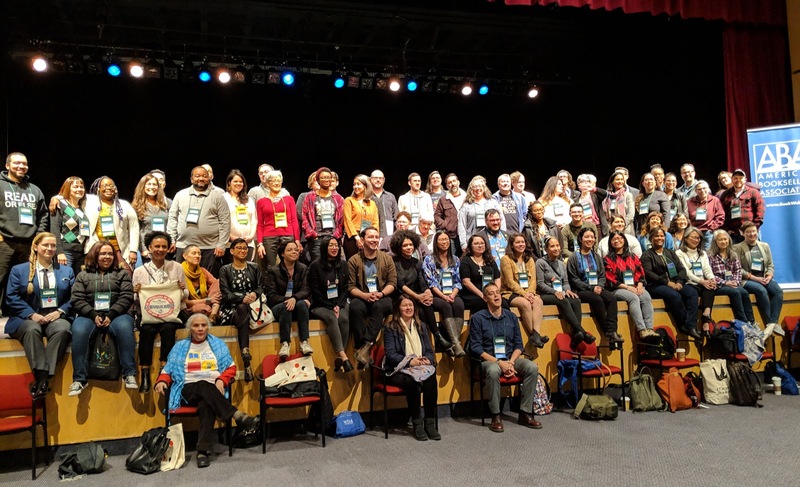 After yesterday's Town Hall meeting, the ABA's Diversity Committee asked everyone who self-identifies as diverse to gather on stage for a celebratory photo. 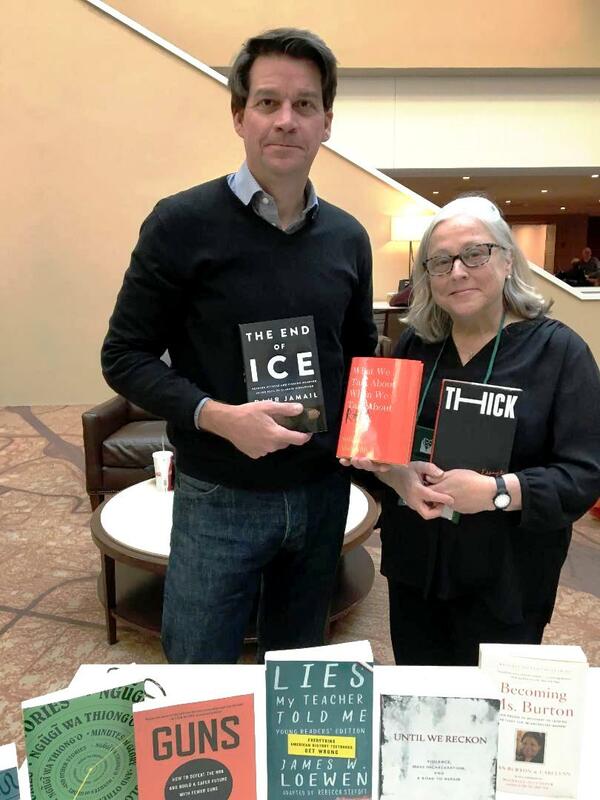 At Wednesday's Speed Dating session for the New Press, Ingram's chief content officer Phil Ollila filled in for sales director Sharon Swados, whose flights were canceled, and helped present New Press titles with publisher Ellen Adler. Word on the floor was that he was "a natural." 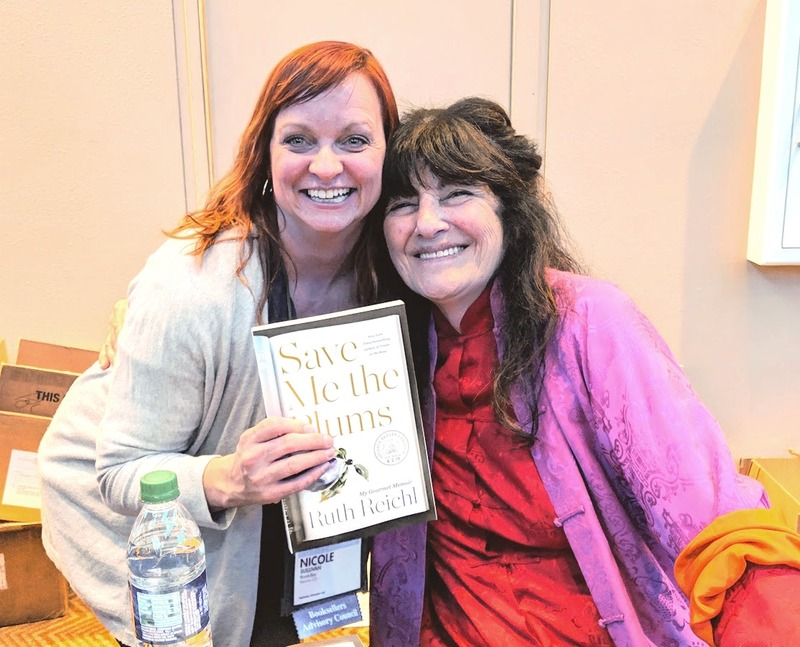 Nicole Sullivan of BookBar in Denver with Ruth Reichl, whose new memoir, Save Me the Plums, will be published by Random House in April. BrocheAroe Fabian of River Dog Book Co. in Beaver Dam, Wis., Clarissa Murphy, MIT Bookstore, Boston; and Josh Christie, Print: A Bookstore in Portland, Maine, at the Author Reception. We realize that the caption accompanying a photo we ran in yesterday's issue from Wednesday night's reception was insensitive. We apologize, and we've removed it from our website. We've learned from this and promise to do better in the future. "I think this is very uplifting. We're all still in this room. There's still books, people are still reading them," said Margaret Atwood, author of The Handmaid's Tale, The Blind Assassin and much more, during the breakfast keynote on the second day of Winter Institute 14 in Albuquerque, N.Mex. "Part of the uptick of books is that's one of the places people go when they feel under both political and psychological pressure," Atwood continued. "It is actually quite helpful to know that other people have been through similar things before, and have come out of them." Atwood was in conversation with Erin Morgenstern, author of The Night Circus and the upcoming The Starless Sea, and during a wide-ranging, illuminating and often funny discussion, topics ranged from forthcoming novels to blurring genre lines, early book-signing experiences, and past and present reactions to The Handmaid's Tale. On the subject of her new novel, The Testaments--the sequel to The Handmaid's Tale coming from Nan Talese/Doubleday on September 10--Atwood joked that her publisher would kill her if she said too much, but she did say that it is set 16 years after the events of the previous book and features three narrators. Beyond that, her publisher "would be very cross" with her. When asked what led her to return to the world of The Handmaid's Tale more than 30 years later, Atwood replied that there have "always been a lot of questions asked" about the book, like what happens next and what happens to the main character after the end of the novel. She said that she never answered those questions, because she didn't know. Writing The Testaments, Atwood explained, was "an exploration of the answers" to those many questions. Atwood recalled that following the publication of The Handmaid's Tale in 1985, there were a handful of major reactions. The English, "having done their religious civil war in the 17th century, said 'jolly good yarn.' " Canadians, meanwhile, "being nervous by nature," wondered if it could happen in Canada, which Atwood doubted. And in the United States there were two different reactions: one being, this will never happen here--"wrong," Atwood remarked--and the other being, how much time have we got? She said that the 2016 election changed the way people viewed the book and especially the television show, which had started shooting in September 2016. She reported that when the show's cast and crew woke up on November 9, they all said to themselves, "We are now in a different show." Nothing changed in terms of what they were filming, Atwood added, "but the frame changed," as did the frame around the book. While discussing their first book-signing experiences, Atwood said that hers was in 1969 in the men's sock and underwear department in a Hudson's Bay Company in Edmonton, Alberta. The signing was for her debut novel, The Edible Woman, and she reported that she "frightened a lot of men" who had come in to buy socks and underwear, and she sold a grand total of two copies. The only signing she ever had that was worse, she continued, was held in a bookstore in a suburban mall in Winnipeg on a Tuesday afternoon. "Nobody was in the mall and nobody was in the bookstore," and when someone finally approached her signing table it was just to ask where he could find the Scotch tape. Atwood and Morgenstern also talked about the forthcoming graphic novel adaptation of The Handmaid's Tale, drawn by artist Renée Nault (Nan Talese, Mar). Atwood related that the graphic novel, which she described as "gorgeous," entered production about five years ago and has taken so long in part because of Nault's perfectionism and her desire to color every single frame by hand. "Finally it's here," said Atwood. "I'm not any longer writing little notes saying 'how can I help? Would you like me to hand-color some of those pages?' "
Atwood noted that interpretations and adaptations of The Handmaid's Tale have "proliferated in an odd kind of way" over the years. In addition to the graphic novel and television series, it's been an opera, a ballet, various plays written and performed by university students and a variety of parodies, like FunnyOrDie's Handmaid's Tale for Men. She's also built a collection of what she's dubbed "Handmaid's Artifacts," including something called "The Handsoap's Tale," which is a soap dispenser that features a picture of a red handmaid's dress and white bonnet; a photo of Melania Trump's bizarre red Christmas trees; and countless photos of pets in white veterinary collars made to look like handmaids. Hanif Abdurraqib opened the Wednesday afternoon keynote by reading from his new book, Go Ahead in the Rain: Notes to A Tribe Called Quest (University of Texas Press), then said: "I thought it would be cool to read that passage to start out because it's a story that's mostly about a journey back that reading a book took me on. I read Friday Night Lights when I was like 19 and immediately wanted to go to Odessa, Tex., which is very odd, but I think all the time about what is reading if not a way to indulge our foolish passions." Reading and music melded seamlessly in Abdurraqib's presentation. Noting that many people had asked him why he would write about A Tribe Called Quest, he said, "There are a lot of reasons that make sense or that sound good or that work well in an interview, but I think ultimately I'm fascinated by what sampling actually is in my head, or what sampling asks of both the listener and the creator." He added that "if you are at least arrogant enough or ambitious enough, the work of a sample is to say that this once finished product could live a better life than the life it was given at first.... There's something really miraculous about that to me.... To say that atop the already spectacular there is another crescendo." Abdurraqib is always thinking about parallels between sampling and reading. The idea of the sample "is to hear the world differently. When I read a book, I imagine that I am able to briefly borrow the eyes of a speaker and look up and see a different world. If we're lucky enough, we are reading books that are engaging us and we get to see the world differently each time or imagine a different place than the one we're in." The first time he read Their Eyes Were Watching God, he was "able to, for a moment, borrow the eyes of Zora Neale Hurston's speakers and see a different world." 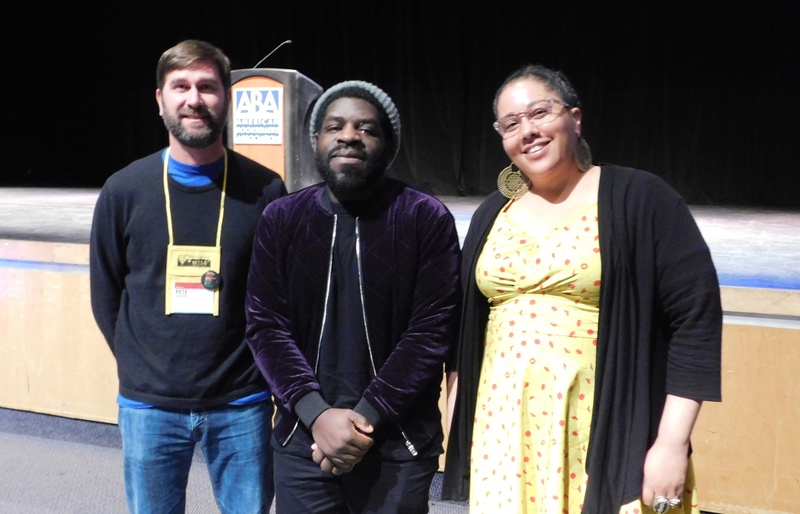 Hanif Abdurraqib, flanked by Pete Mulvihill and Mary Goree of Green Apple Books, San Francisco. Because he visits a lot of indie bookstores while traveling, Abdurraqib has noticed that booksellers gradually take on the identity of the store they're working in, "and the stores themselves begin to take on the identity of the communities they're in. So there's this really intense ripple effect that echoes out throughout a bookstore's life from the people to the brick and mortar shop to the community around it that I think in some ways is not unlike the art of sampling, where there are individual parts coming together, harmonizing the same way." Growing up in Columbus, Ohio, he said the labyrinthian Book Loft, a "beautiful, vital piece of the community" where people can "literally get lost," was a formative influence: "For me as a teenager, that was so important. It was important to read my way out of this maze. Just pick up a book and be like, okay, now I'm reading this music biography, what's next? And go from room to room to room to room. In piecing together the little parts of all the books I consumed, I was, by the time I exited the Book Loft, able to imagine a different and better world than the one I had when I entered. And that too is a type of sampling." Abdurraqib confessed he has "always had the desire to be someone who lived a life as a regular in some kind of indie bookstore like they do in the movies. But because of the fact that I've had people believe in my writing, I've gotten the opportunity to be a regular at many indie bookstores and that's been a real dream come true." 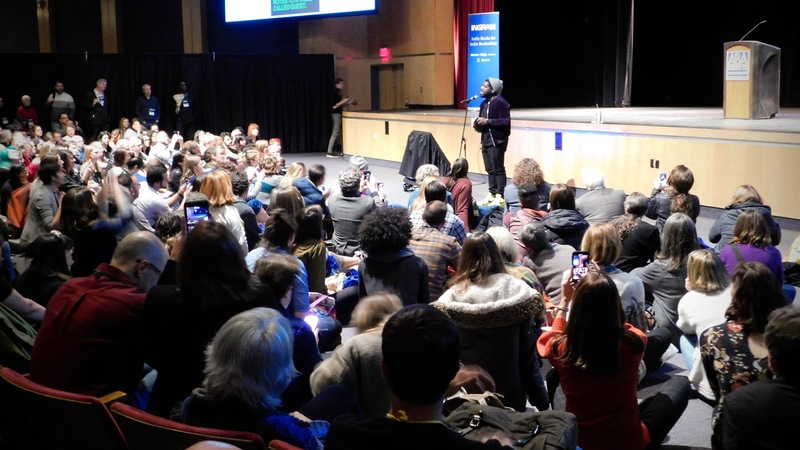 During the sound check before his keynote, Abdurraqib had noticed the wide gap between stage and audience in Kiva Auditorium, which inspired a change of plan. So just before taking questions, he suggested a crowd adjustment that, as he'd noted earlier in another context, might help this once-finished product live a better life than the life it was given at first. Diana Athill, who was "one of book publishing's most remarkable editors, but in the latter part of her life it was her own writing that brought her much-enjoyed literary success," died January 23, the Guardian reported. She was 101. After the publication of Stet (2000), which described her long career at André Deutsch, "forgotten books were reprinted and new writing emerged," including the bestseller Somewhere Towards the End, winner of the 2008 Costa prize for biography. In 2009, four volumes of her memoirs were republished as Life Class. Her books include Alive, Alive-Oh! ; Other Things That Matter; Instead of a Book: Letters to a Friend; A Florence Diary; Yesterday Morning; and Make Believe. She was made OBE in 2009. Athill wanted to be a librarian, but during World War II she joined the BBC's information department. A meeting with Hungarian émigré André Deutsch at a dinner party in 1943 changed her life. At the end of the war, she joined as an editor in his first publishing venture, Allan Wingate. Eventually she became founding director of his new company, André Deutsch, and remained there from 1952 until her retirement, at 75, in 1993. In publishing, a career "where women were usually in the publicity department rather than the boardroom, [Athill] found her niche: in her gift for discovering new authors and for her dealings with them and their writing she would become known as 'the best editor in London,' " the Guardian wrote. Among her authors were Molly Keane, V.S. Naipaul, Mordecai Richler, Brian Moore and Jean Rhys. Granta publisher Sigrid Rausing told the Bookseller that Athill "was a soldier for clarity and precision, a clever and competent young woman brought by a combination of forces to a heady mix of London publishing and post-war love affairs. It is tempting to see one as the counterpoint of the other--sexual passion vs editorial discipline. I think the combination strengthened her, certainly as a writer, and probably as an editor (and lover) too. "She had, in any case, the rare ability to grow seemingly stronger, not weaker, with everything life brought her, transcending the prejudices of her day and learning from mistakes. And what a writer she was.... Diana was an institution at Granta. News of--yet another!--new book was always greeted with unanimous glee and joy in acquisitions meetings. We will miss her indomitable spirit." In a tribute published by the Guardian, writer Damian Barr described Athill as "the clearest of voices, sharpest of wits and finest of friends. A cool pioneer for women in publishing and a passionate advocate for outsider voices.... Diana was reading and writing and laughing and loving until the very end. She was 101 but her real triumph was not living long, it was living gloriously. Her eyes are closed now but to see as clearly as she did we need only read her words." 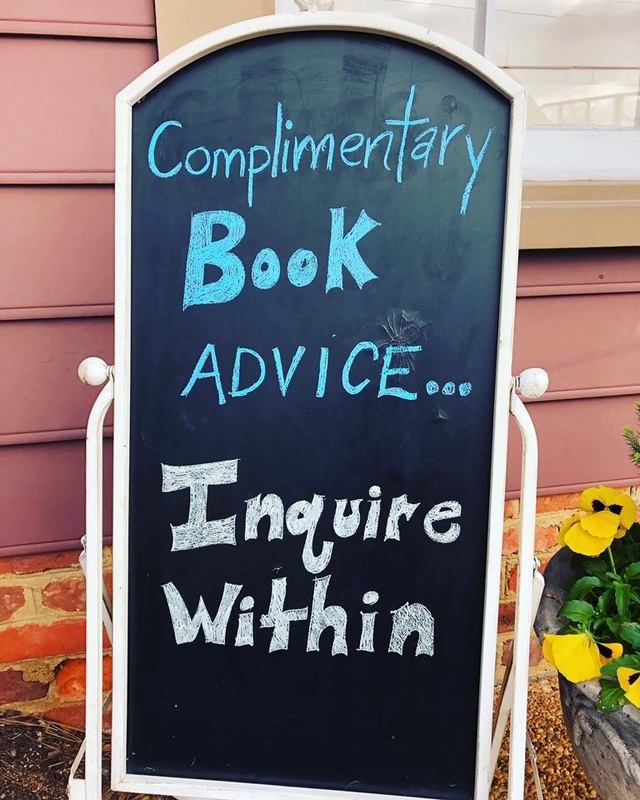 The Little Bookshop, Midlothian, Va., shared a photo on Facebook of its sidewalk chalkboard sign, which read: "Complimentary Book Advice... Inquire Within." What attracted you to bookselling? I was an anxious kid, seemingly allergic to the outdoors and without cable, so I relied heavily on reading for entertainment and as a coping mechanism. Being around books makes sense to me. I also value being part of a larger community of book lovers, authors, and weirdos. Most of the weirdos are also booksellers. What is the most pressing issue facing bookselling today? As an independent bookseller, I'd say the constant flux of the industry is an ongoing challenge. Not to mention the popularity of certain major online retailers and wholesalers. That being said, I think we're holding our own rather well. Elisa Gonzalez has been promoted to v-p, sales, North America, and will be responsible for the company's domestic and Canadian sales as well as special markets, museum and distribution sales, and the day-to-day operations of the New York-based sales teams. 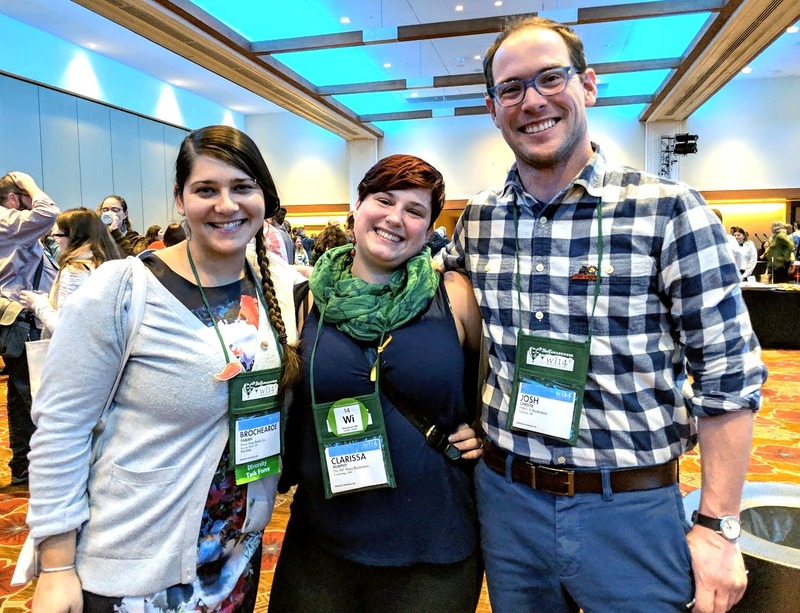 Since joining Abrams in 2008 as sales manager for children's books, she has held the positions of director of sales and, most recently, executive director of sales. Mary Wowk, who had been v-p of sales at the company since 2007, assumes the newly created role of senior v-p, international sales, with responsibilities for sales in the U.K. and export markets including Europe, the Middle East, Africa, Asia, Australia, New Zealand, and South America. She will work with Abrams's existing sales and marketing partners, Abrams and Chronicle Books, Thames and Hudson ANZ, Baker & Taylor Global Distribution Services, and Hachette's export team. Jennifer Yim has been promoted to marketing and publicity coordinator, children's. Previously she was marketing and publicity assistant. Madison Killen has been promoted to digital marketing manager, children's. Previously she was marketing manager, children's. Jenna Homen has been promoted to digital marketing manager, adult. Previously she was content and community manager. Julia Hass has joined the company as marketing and publicity assistant, adult. Previously she was a publicity assistant at Counterpoint Press. Shawn Sarles has joined DK as a sales manager. Sarles previously worked as a sales analyst for Hachette. Katie Schloss has joined DK as brand manager. Schloss previously held sales, marketing, and social media positions and licensed a jewelry line to A.JAFFE. 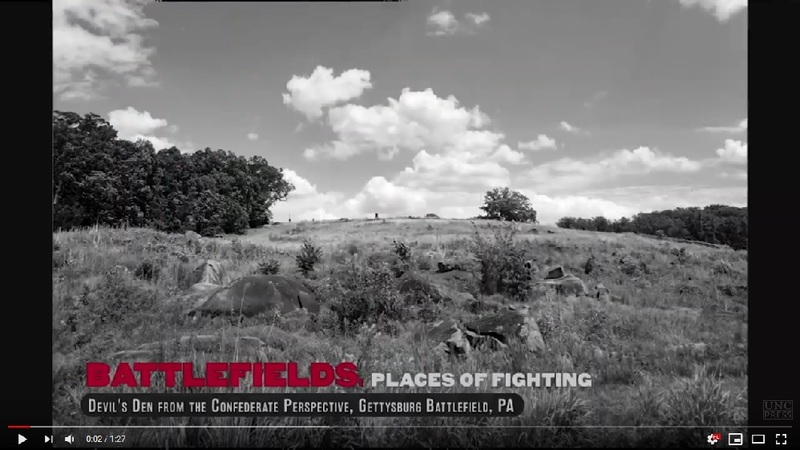 Civil War Places: Seeing the Conflict through the Eyes of Its Leading Historians, edited by Gary W. Gallagher and J. Matthew Gallman, photographs by Will Gallagher (University of North Carolina Press). "In a competitive situation with several companies pursuing," Entertainment One acquired the TV rights to Jenny Lee's upcoming YA novel Anna K, a modern retelling of Leo Tolstoy's Anna Karenina. Deadline reported the story "follows a Korean-American 'it' girl caught between her picture-perfect, family-approved boyfriend and the guy who might just be her one true love, along with her high-flying cast of friends and family." The book will be adapted as a TV series with Drew Comings' Creative Engine Entertainment and Scooter Braun's SB Projects. Lee, who is also a TV writer (BET's upcoming Boomerang series reboot), will write the adaptation. "Jenny is an incredible writer and we love the re-telling of this classic story with a diverse cast of characters," said Braun. "We've also found great collaborators in Mark Gordon and his team at eOne. This is going to be a really special project." The novel was acquired pre-emptively by Sarah Barley and Caroline Bleeke of Flatiron Books and will be published in 2020. Deadline noted the "big interest in the property was likely fueled at least in part by the success of Crazy Rich Asians which became a box-office and pop culture hit." 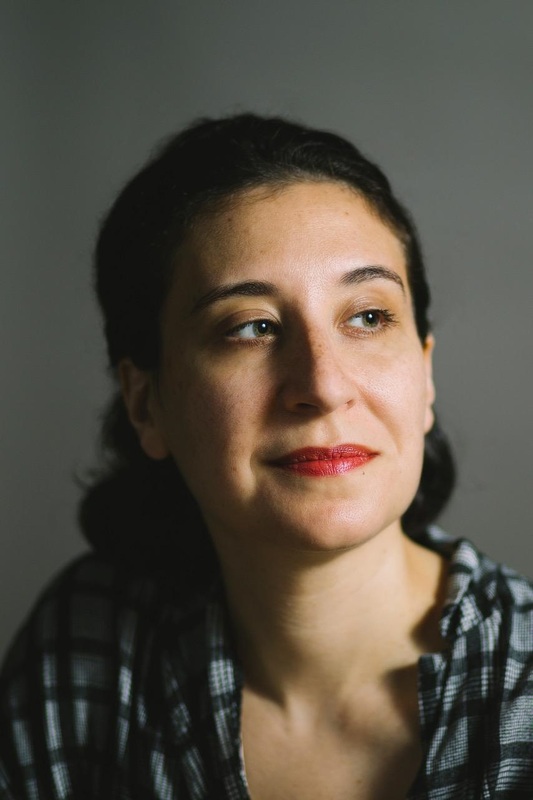 PEN America has announced finalists for the 2019 PEN America Literary Awards. See the many hopefuls here. Juliet Lapidos is a senior editor at The Atlantic. Previously she was the op-ed editor of the Los Angeles Times, a staff editor on the opinion section of the New York Times and a culture editor at Slate. 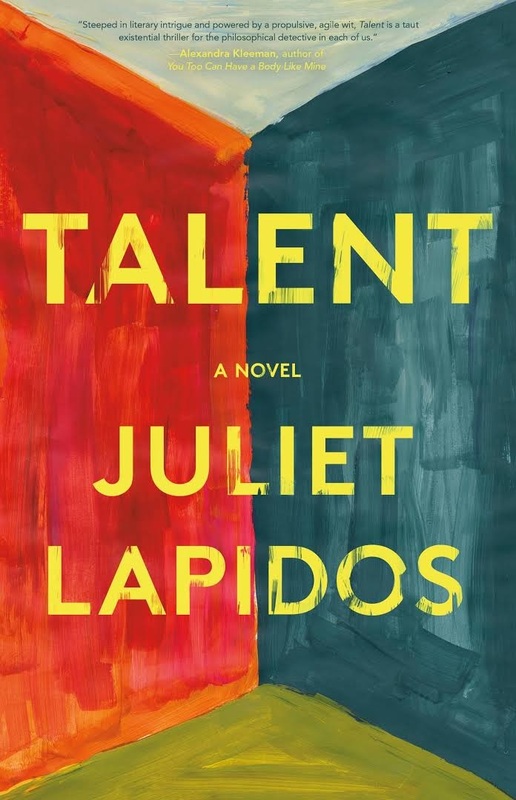 Her first novel, Talent (Little, Brown, January 22, 2019), is a wickedly caustic tale of a grad student in search of inspiration who stumbles on a literary treasure. The Story of the Stone, Part III by Cao Xueqin, an 18th-century epic novel. I'm a rules-based reader and one of my rules is that I must always be in the middle of a series. I've read Dance to the Music of Time by Anthony Powell, The Hunger Games by Suzanne Collins, The Sea of Fertility by Yukio Mishima and many others. I read one volume/installment per year, stretching out the process. Story of the Stone, also known as Dream of the Red Chamber, fits the bill. In my inexpert opinion, it's uneven, great in spots (especially the lurid and supernatural spots), dull in others (how much slice of life can a person handle?). But another one of my rules is that I must finish every book I start, so I have two more volumes to go after this one. The Phantom Tollbooth by Norton Juster. I haven't read it for years, but I still remember many moments clearly--like when the Mathemagician serves the stew that stokes, rather than sates, Milo's appetite: The more he eats, the hungrier he gets. A People's History of the United States by Howard Zinn. I feel as though I have read it, but I have not in fact read it. Lucky Jim by Kingsley Amis, the funniest work of art ever produced in any medium. Trust me. I've never done this, unless you count the time I gave away my beat-up copy of Catch-22 and replaced it with a nicer edition (with a nicer cover). The Bible Code by Michael Drosnin. My parents were not into book-banning but I was rather embarrassed to be reading a book that purported to find a code in the Bible. If I had not been reading The Dispossessed by Ursula K. Le Guin on the subway, I would not have missed my stop and would not have met my husband on the opposite track while waiting for the next train. In this way, The Dispossessed literally changed my life. Except it didn't because that didn't happen, but it's a nice story, and I do like The Dispossessed (or my memory of it; it's been a while). "In the beginning was the Word, and the Word was with God, and the Word was God." I have it on good authority that John was referring to Jesus, but--no matter--he captured beautifully the now what-else-is-new observation that language is essential to consciousness. Close runner-up: "One day I got an urge to go and check up on the outside world myself. Nothing much to report." That's from Tom McCarthy's Remainder and, as Zadie Smith explains in her essay on the novel, it's a fantastically dry way to skewer traditional realist descriptive passages. I won't part with any book, but the first five books on my bookshelf (arranged chronologically) are: The Epic of Gilgamesh, the Bible (King James translation), the Bible (New Jerusalem), The Iliad by Homer, The Odyssey by Homer. Mating by Norman Rush brought me an enormous amount of pleasure--ditch plans with friends type of pleasure. In the aftermath of the Nuremberg trials, most people want to move on from World War II stories. But British journalist Ian Graham, who lost his brother, Sebastian, in the war, has given up writing to spend his life hunting down Nazi criminals. Ian and his business partner, Tony, join forces with Ian's estranged Russian wife, Nina Markova, in a quest to track down Seb's murderer, a woman known as die Jägerin: the Huntress. Kate Quinn's gripping novel follows the trio as their story intersects with that of Jordan McBride, a young aspiring photographer in Boston, and her stepmother, Anneliese, whom Jordan suspects isn't telling the whole truth about her past. Building on her success with The Alice Network, Quinn constructs three intertwining narratives: Ian's no-nonsense investigative work (which keeps getting inconveniently hijacked by his emotions); Jordan's hunger to follow her passion for photography and to figure out what Anneliese is hiding; and Nina's journey from her half-feral childhood on the banks of an isolated lake in Siberia to her career as a decorated Soviet pilot. Based on the real-life flying exploits of female aviators during the war, Nina's story is by far the most dramatic. Fiercely independent, mistrustful of others and completely in love with her plane, Rusalka, Nina becomes an opponent worthy of the titular huntress. Though Jordan is much more sheltered, she displays the same drive and tiger-like courage when it comes to photography and to protecting her young stepsister, Ruth. And Ian, though he tells himself this is just a job, is bent on justice for his brother--or is it revenge? While readers may guess the huntress's identity long before Ian and his team can prove it, Quinn's narrative is full of suspense. Nina's daring bomb runs in bitterly cold conditions on the eastern front provide the most exciting scenes, but the gradual unfolding of Ian's wartime and postwar experiences quietly ratchets up the novel's tension. (His partner, Tony, provides much-needed wry comic relief and also forces Ian to consider his own motivations.) And though Jordan struggles with more mundane worries such as whether to marry her high school boyfriend or pursue a career, her keen observational eye and instincts pull her story forward. All the characters must decide how to move on despite the scars they carry, and whether to open themselves to the risks of friendship and love. 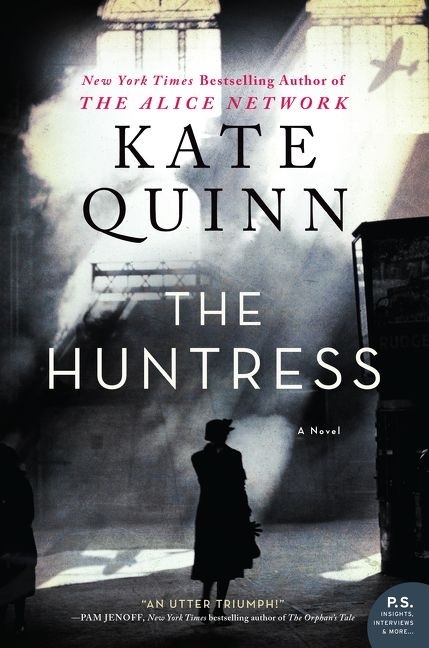 Shelf Talker: Kate Quinn's gripping novel follows a British journalist and his estranged wife on a quest to track down a Nazi murderer.